Hi and Happy Thursday! Here I am with a very young Ian at the beach. We were enjoying the sand and waves. He was hanging on tight to my hands. He was such a little guy but very brave to stand up against the power of the ocean waves. Since then, he has loved being at the beach and seeing the ocean. Like me, he enjoys putting his toes in the water and feeling the cold water on his toes and legs. This summer we did some of that again and it was such fun. I have loved all of these years taking him to the beach in his young life. All but two summers we have enjoyed time at the beach, which has been great. He has loved the whole beach experience just like I always have. There is nothing like standing at the edge of the ocean and feeling the sand in our toes and the water washing over us as the waves move back and forth. Ian held my hand this summer as we waded up to our knees in the water. It was as fun this year as when this photo was taken. 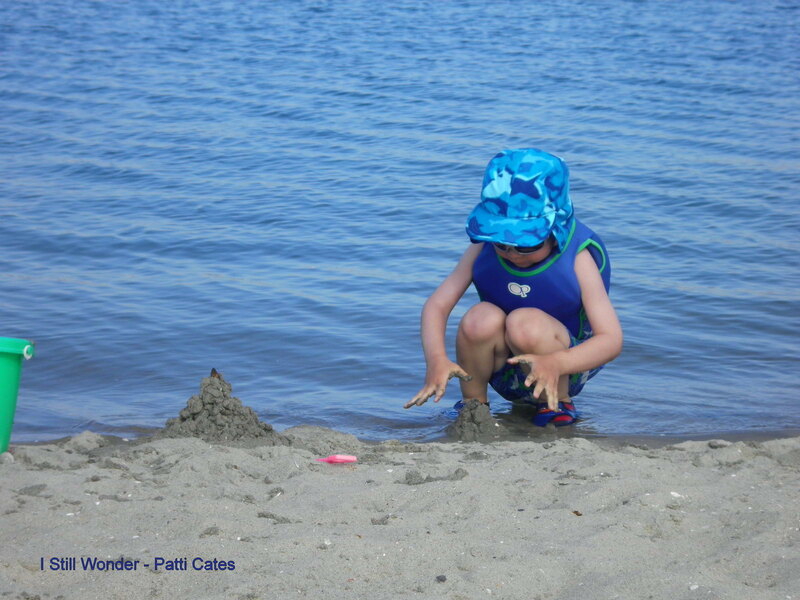 I also have enjoyed watching Ian play in the sand, building structures with wet and dry sand, being buried by his cousins and then popping out again, running around on the sand, throwing a frisbee, and having a wonderful time. We love the beach, the ocean, and all of the fun with our family and friends. There is nothing like a trip to our favorite beach. I am blessed to have Ian be the fourth generation in my family to enjoy these trips. I love the smell of the salt and water. I love the sound of the surf and people playing. I love the feel of the sand in my toes. I love the cold water washing over my feet and legs. I love watching the waves come into the shore and back out again. I love how the sun dances on the water during the day. 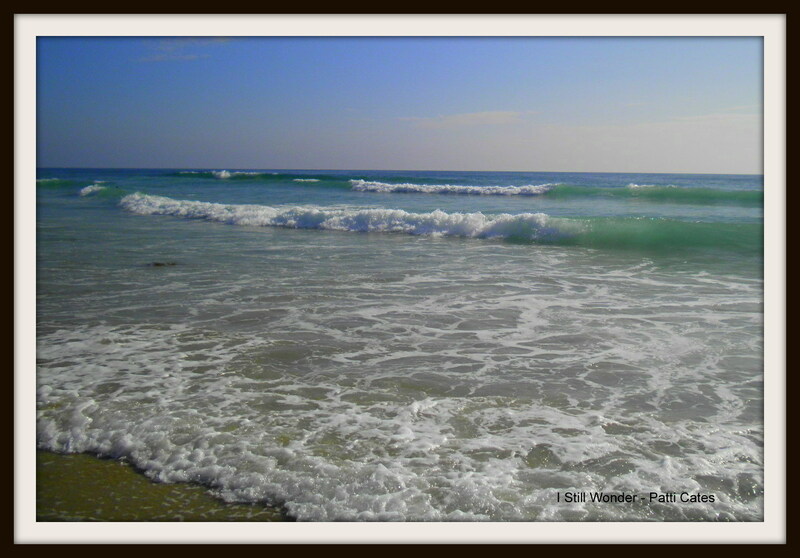 I love the vastness of the ocean and the power of the waves. 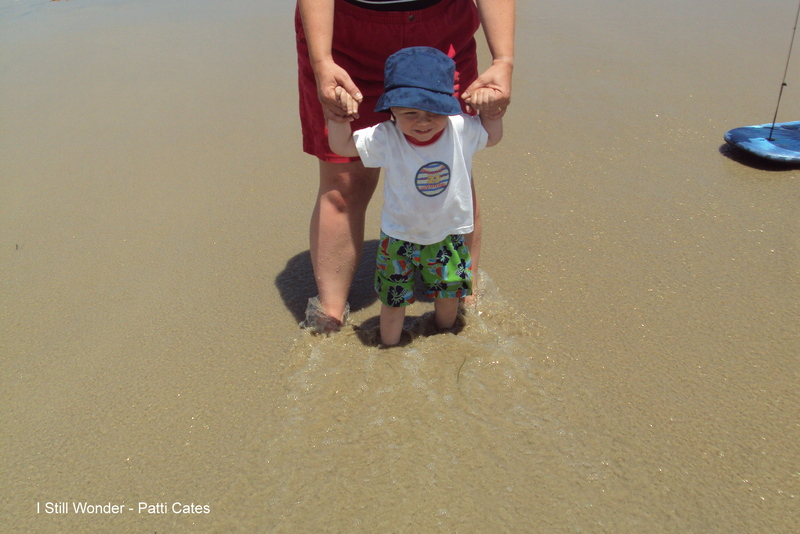 I have loved the ocean since I was about 6 months old and crawled right to it. It has always drawn me to it. I love this beach in Mission Beach, California. I have had the privilege to go many, many times throughout my life. I love going to the beach with my husband, our son, my parents, siblings, cousins, nieces and nephews, aunts and uncles, and friends. I love that our family continues to gather at the ocean’s edge and at the beach house. I love that all things about the beach experience have been a part of my life for so long. I feel truly blessed. I love the memories of decades of visiting this beach. I love this Pacific Ocean. I wonder when we can next enjoy our fun at the beach? I hope it will be soon! I don’t like to be away very long. What The? Just one week left of summer? How is that possible? Where did the time go? How did it get here so fast? So I have to buy school supplies to buy this week? No more late nights during the week and sleeping in? It seems we just started our summer and now it is nearly over. My time flies when you are having fun! And we had a lot of fun and a great summer. Hope your summer has been great as well. It is hard to believe that one week from today, Ian will start 2nd grade. He is starting his fourth year of school and that is amazing to me. He loved preschool, kindergarten, and 1st grade. And, now for 2nd grade. I wonder who his teacher will be? We should find that out in a day or two. I wonder what friends will be in his class? I hope several that he has known and he can always make more. We love school so the transition will be good. I just always want more summer and more time to enjoy one another without our normal commitments and schedules. We have had a great summer and have done so many fun things. We have made memories, spent time with many loved ones, and have so enjoyed a relaxing schedule. This photo was taken in the mountains in California. Here are Ian and I in the meadow on our amazing visit. That was a great day and one of our many fond memories. This week we will purchase his school supplies, get back on our school schedule, and get our minds back on school. Still we will enjoy the last few days of summer with games, swimming, and plenty of other activities. I wonder if I can savor this last week of the summer of 2015? I plan to do just that and enjoy all of the memories that we made. Hi and Happy Friday! Hope you are having a great summer! Mine has been good and very busy. I just noticed that this is the third posting for July — sheesh! As you may have read in my post from a week ago, we had the pleasure of attending a family reunion. It was so much fun but went by way too fast. I did my best to savor each and every moment. Therefore, I wasn’t on the computer much at all. Taking a break was nice. One of the places we visited while in California was Mt. Laguna. This photo was taken from the last time we visited. 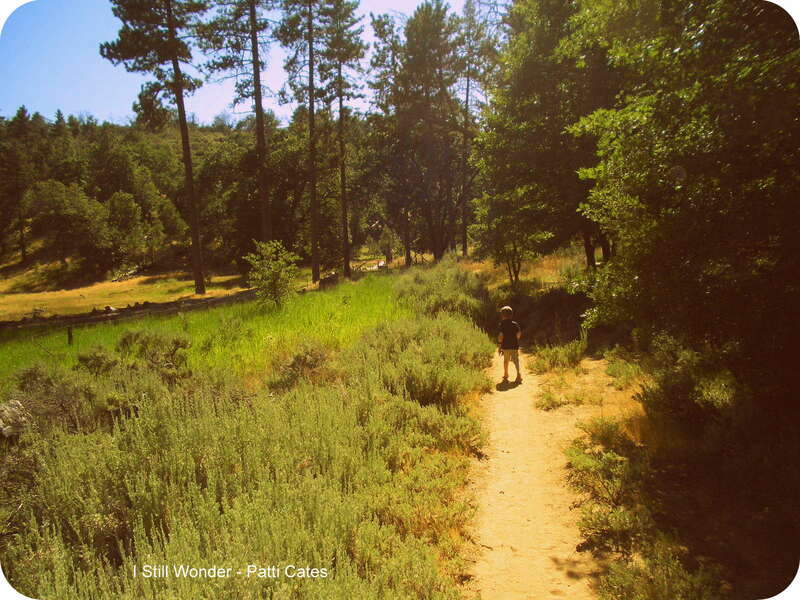 Ian is walking down the path where my grandpa used to say Willie our elf friend lived in his cabin. It was fun that year to find an actual building. Being there again was great. Ian and I enjoyed a day with my mom and her two sisters. We stopped at a diner for lunch on the way to the mountains, enjoyed the beauty and smell of pine trees, had time to shop and find Ian a new stuffed wolf friend, and on the way back, stopped to get him some Lego toys. This was one of many great days. We also had several weeks with family and friends in North Carolina. That too was lots of fun. We enjoyed seeing Ian’s best friend from preschool, enjoyed yummy king crab legs and corn on the cob for dinner, went shopping at some favorite stores, and had time to play. Now after being gone for a month, we are back home. It is nice to be in our own space again. Today is full of laundry, catching up on our mail, unpacking all of our stuff, settling into our normal routines, and sleeping in our own beds. We are busy yet glad to be back home again. Don’t get me wrong, we had a great time while we were gone. It was fun to visit friends, chat with family members, sleep in a variety of places, and enjoy food that we don’t often have. Still, there is no place like home and I am glad to be back. There is much to be thankful for. We have had a great summer and made so many memories. 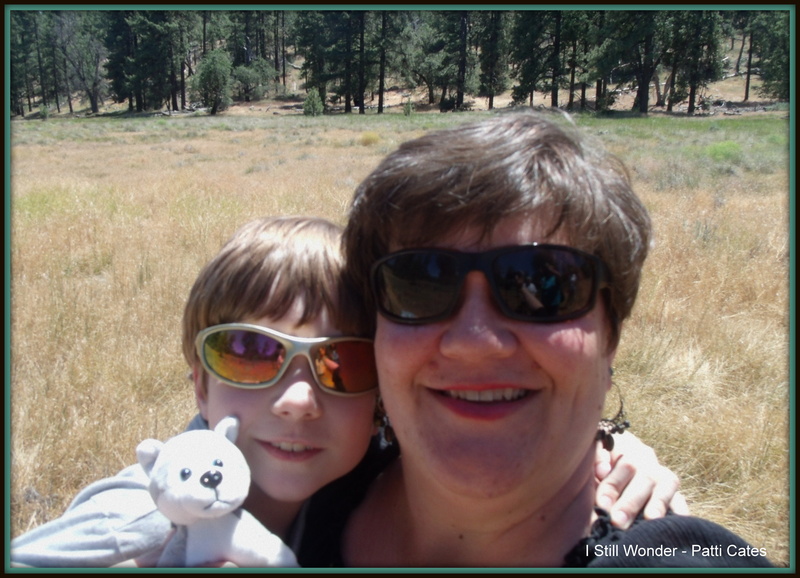 Our traveling was truly wonderful and being home again is also wonderful! Hi and Happy July! Hope you are having a great summer! I just returned from a wonderful week in San Diego, CA. I was there with my family for a family reunion and 50th anniversary celebration. It was fun spending time with so many loved ones. I am blessed to have a family who despite our many differences, we have learned a way to have fun and enjoy being together. We have lively discussions and don’t agree with everything, but still respect one another’s opinion. And, love underlies all that we do. I love these people so very much. So, it was a true and amazing blessing to see them — parents, aunts and uncles, cousins, siblings, nieces and nephews, and friends. So many people and so much love. My grandparents would have loved seeing all of us! Over the years of growing up, we spent a lot of summers together. We have many fond memories of our time together. Now, many of my cousins and I have our own children who are also enjoying time together. Now, four generations have enjoyed this special family time. Because of our week of visiting, laughing, eating, walking, swimming, and enjoying the ocean and beach, I have been off the computer. Taking a break was nice but I am glad to be back. I plan to write more regularly for the rest of the month and summer. Our reunion party included a 50th Anniversary celebration for my parents. This was in the same room of the family church where my great-grandparents had celebrated their 50th. In another room at the same church, my grandparents celebrated their 50th as well. It is wonderful to have such long line of great marriages in our family. I wonder when I will next see my amazing and wonderful family? I sure hope it’s soon. I so love all of them and cannot wait to see them again. Don’t you just love the summer? I sure do. We have been quite busy this month and so I haven’t been able to write as much. A lot is going on each day, so time for the computer can be a challenge. I miss the writing, but I am having a lot of fun with long conversations with Ian, having time for work and play, staying up later than we normally do, and having time to relax. This picture was taken a few years ago of Ian at the beach. He was playing in Mission Bay and having a great time! Here are a few thoughts and quotes about the summer. Enjoy! I will try to post more regularly very soon. The sun not setting until almost 10 p.m. I wonder what the rest of the summer will bring? I imagine a lot of fun and a trip to the beach. Can’t wait! Have a great one!!! Hi and Happy Friday! Hope you have a great 4th of July weekend. I am looking forward to the time, although it will be raining for much of it. Here I am pictured with Kirk in our 4th of July finest. 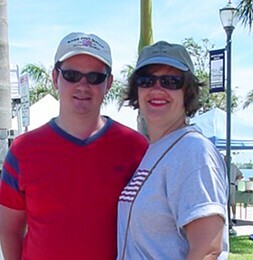 This was taken in Fort Pierce, FL, before Ian was born. Seems like forever ago. 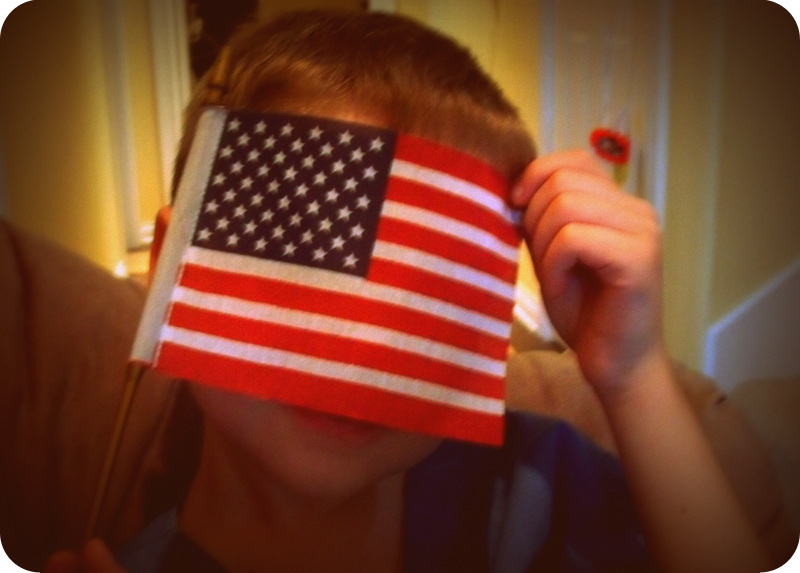 The below picture was taken a few years ago of Ian holding the United States flag in front of his face. It was posted originally for a photo of the day challenge. I always enjoy our Independence Day celebration — with a cookout, flags waving, patriotic music, and fireworks. It is a time to enjoy and have fun with family and friends. I also like to stop and be appreciative of the freedoms our country has. I feel blessed to have them. I also like to thank those who have made this freedom possible. Thanks to our veterans and current servicemen and women. Because of you, we can live in the land of the free and the home of the brave. I wonder if we can truly appreciate our freedoms and live life to the fullest while being kind and loving to others? I hope and pray that we can! Hope you have a great weekend. It is amazing to me that it is already the first day of July! Our summer is flying by. We are having a blast and are quite busy, so that is why I haven’t been writing as much. How is your summer going? Is it hot and humid where you live? Or is it cool? Or wet? There seem to be many kinds of weather this summer that we don’t normally see. We have had quite a bit of rain, strong thunderstorms, and lightning. Thankfully no flooding as in some parts of the country. And no fires. I realize how blessed we really are for that. My prayers go out to all of those who have suffered losses. The air is often very humid in the summer where I live. So it feels sticky anytime that you go outside. After living in the same state throughout my entire life, you’d think I was used to that. But, I am not. We have had a recent break in that humidity and it has been so nice. On a recent lunch out, we had a pleasant meal on the deck of the restaurant. There was even a nice breeze. That is how the weather is in the summer at Mission Beach, CA. The above picture is of the ocean there. I just love that beach and the Pacific Ocean! It is a place I love to visit. Thankfully we are going there this summer and I am so looking forward to it! Nothing says summer to me like a trip to the beach! How about you? I wonder if the rest of our summer will be as much fun as the first half was? I think that it will be. I am certainly looking forward to it.